Colleagues and friends are remembering William (Ted) Bluhm, a political theorist and University of Rochester professor emeritus in the Department of Political Science, whose work on political philosophy and ethics endures. “He was someone who early on looked at medical ethics, as developments in human biology allowed us to ask questions that we could never have imagined before,” says Richard Niemi, the Don Alonzo Watson Professor Emeritus of Political Science. Bluhm, who was a member of the Rochester faculty for 36 years—from 1957 to 1993—died in November at the age of 95. His research focused on political philosophy, ethics and public policy, and political culture. During his long academic career, he worked on systematic philosophical questions regarding the ways humans arrive at moral judgments and decisions. In later years, Bluhm studied how evolving technologies necessarily created new moral challenges and dilemmas. His most recent research, framed in the classical, philosophical tradition, focused on the systematic ethical frameworks available to help answer complex policy questions. “Bluhm was widely well liked,” says David Rohde ’71 (PhD), the Ernestine Friedl Professor of Political Science at Duke University, who took two of Bluhm’s graduate classes. Rohde came to Rochester when the PhD program in political science was still in its infancy—barely five years old. “We were the largest cohort of PhD students then,” recalls Rohde. “All 12 of us—more than faculty members.” As part of a “passionate, assertive” group, Rohde remembers plenty of interaction and lively arguments in Bluhm’s seminar on political philosophy, which was a required introductory class for all incoming PhD students. “It was always a challenge for Ted to manage us,” chuckles Rohde. “Sometimes he would just get elbowed out of the way.” Rohde also interacted with Bluhm on a more personal level: the then newly married Rohde and his wife sometimes looked after Bluhm’s young children when Ted and Eleanor (Elly) Bluhm went out of town for a weekend. Over the course of his distinguished career, Bluhm authored seven books spanning more than four decades: Theories of the Political System (Prentice-Hall, 1965), Building an Austrian Nation: The Political Integration of a Western State (Yale University Press, 1973), Ideologies and Attitudes: Modern Political Culture (Prentice-Hall, 1974), The Paradigm Problem in Political Science (Carolina Academic Press, 1982), Force or Freedom? The Paradox in Modern Political Thought (Yale University Press, 1984), The World of the Policy Analyst: Science, Values, and Rationality (co-author) (Chatham House, 1990), and Ethics and Public Policy: Method and Cases (co-author) (Prentice-Hall, 2007). 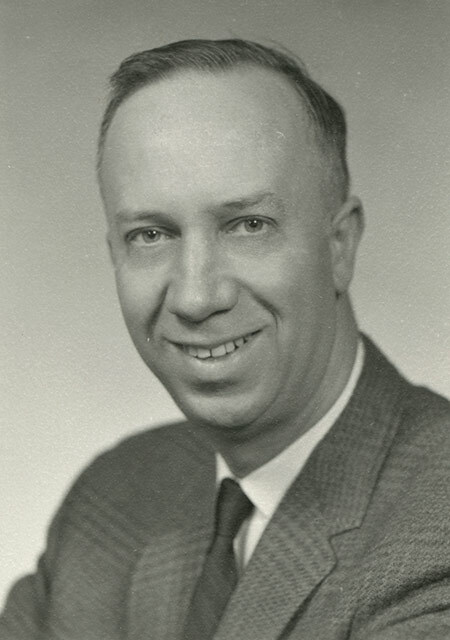 He returned to the University of Rochester that same year, having already worked at the University as an instructor in political science in 1952. Back for good in 1957 and with a PhD under his belt, he started as an assistant professor and by 1967 had risen through the ranks to full professor. Along the way, Bluhm received numerous research awards, including a year’s Fulbright fellowship to Vienna, Austria. “Ted was the guiding force behind the University’s Stammtisch, or German table, which met for years in the Faculty Club,” recalls Randall Stone, professor of political science at the University. He often wore a green Austrian Loden sports coat to those lunches, remembers Stone, and the last time they met, brought along a bottle of Spätlese (a German late harvest wine). Stone says Bluhm’s children tell the story of how they used to beg him to talk to them in Morse code at the dinner table—a remnant from his US Army Signal Corps days—which he was always willing to do. Few knew that sandwiched between his master’s degree and his PhD was a five-month stint at Massachusetts Institute of Technology (MIT) as a research assistant in the Division of International Relations. This was immediately followed by a one-and-a-half-year assignment as an intelligence officer in Washington D.C. with the US government from 1950 to 1951, during the onset of the Cold War. His wife Elly also worked as an intelligence officer during that time. The political scientist had many interests and especially enjoyed traveling, bird watching, and reading mystery novels. He also painted water colors and wrote poetry, says Elly Bluhm, to whom he was married for 68 years. In addition to his wife, he is survived by their children Catherine Dolan, Susanna Cullen, and Andrew Bluhm, seven grandchildren, and one great-grandchild.